[SatNews] Thirteen lightweight antennas that self-deploy in 200 milliseconds have been delivered to support Canada's RADARSAT Constellation Mission (RCM) by Astro Aerospace, a strategic business unit of Northrop Grumman Corporation (NYSE:NOC). Northrop Grumman's RADARSAT Constellation Mission antenna unit in deployed state. Photo courtesy of Northrop Grumman. 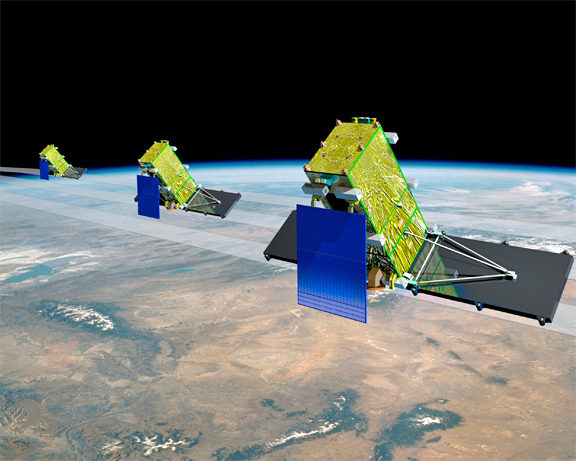 Artistic rendition of RADARSAT Constellation Mission satellites. Image is courtesy of MacDonald, Dettwiler and Associates Ltd. (MDA). The highly configurable antennas are stored energy monopoles that deploy quickly and will be a critical part of the RCM Earth Observation satellites. The antennas will be integrated into the Automatic Identification System payload that will be used to provide an advanced maritime identification capability; enabling ship identification, position, course and speed data. The antennas were delivered to prime contractor, MacDonald, Dettwiler and Associates Ltd. (MDA). The antennas have an adaptable and reliable design that can be easily tailored to specific applications and have been used in the Gemini and Apollo missions and in the most recent U.S. Air Force GPS satellites. 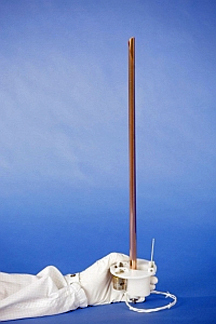 The stowed package is one of the smallest available and most compact for a deployable antenna of a given size. For example, the 13 antennas used in the RCM stow in a low mass and compact 4-inch by 4-inch by 2.5-inch canister. The versatile antennas are available in monopole diameters from one-half inch to 1 3/8 inches and any length up to 25 feet. Dan Johansen, RCM program manager, Northrop Grumman Astro Aerospace, said, "Our continued emphasis on breakthrough engineering has resulted in a 100 percent success rate on more than 1,000 units on satellite missions."